Education begins at home. We, as a family, chose homeschooling as a way to provide the best education for our son in a setting that specifically meets his needs and desires. Through this, we hope to help him become useful citizen of the world, and help him grow as a human. They say that it takes a village to raise a child. I suppose that used to be true, when villages where small and neighbors cared about and helped one another. When life was simpler. However, in 2014, this is not so true anymore. As a former public school teacher, I have seen the village...and I don't want it educating my son. I have taught 7th and 8th grade in a VERY urban, low-income school for the last 6 years. And, for the most part, I loved it. I watched kids grow and become amazing. I felt loved by most of my students and built great relationships with them to help them succeed. And many of them continued on to become very successful. Some even keep in touch and still proclaim that I was/am their favorite teacher. But, something has happened over the last year or so that made me question whether or not this really was the path for me. There grew, in both the students and the school system, a sense of apathy. The not-caring of whether or not the students became productive citizens started to become incredibly overwhelming. Administrators and district personnel have become obsessed with only TEST PERFORMANCE, and not whether or not students are learning a wide range of skills that will better prepare them for entering into the real world. As an educator, it is extremely frustrating to have wonderful ideas for teaching, but have an evaluation system that is based on student TEST PERFORMANCE. It's difficult to want to plan and actually teach when 50% of your evaluation is dependent upon how well the students perform on tests. So, ultimately, we all ended up teaching to the test. Of course, the districts and administrators would have you believe that isn't true. But, trust me, as someone who has been in the trenches, it is. So, could I do this to my son? Could I put him through the same system that was currently failing some of my most beloved students by only preparing them to be a test-takers and not a life-long learners? My son has severe ADHD. As such, he is very active, especially when he is supposed to be sitting still and paying attention (two things that are often difficult for 7th graders, much less a 6 year old). Well, this year he had a teacher who actually punished him, regularly, for his inability to do just that. She knew of his need to move around and that there would be times that she would have to redirect him to remain on task because of him getting distracted (I know this because of the extensive parent/teacher conference that we had with her before school even started and the behavior chart that I provided to her so that she could help monitor his actions), and still he would often be on RED or YELLOW because he couldn't control his outbursts or wouldn't stop talking or would get out of his seat. Children with ADHD have impulse control issues. It's part of the nature of the beast. And, as a teacher, there are strategies that can be used to help with that (again, I know because out of my 6 years, 3 of those where with a SpEd co-teacher in a co-op classroom with students who had severe ADHD). His current teacher's lack of ability to be able to work with my son in a corrective, rather than punitive, way started our frustration. Then came the bullying. As one of the smallest kids in his classroom, Monkey started to get picked on by some of the bigger kids. He is also naive (so sue us for wanting to maintain as much of our son's innocence as possible), so he's been able to be talked into doing things that are incredibly inappropriate because of some of his more worldly classmates who have been allowed to experience things that no 6 year-old should experience. Again, could I do this to my son? Could we allow him to continue in an environment that wasn't going to meet his special needs, or be able to supervise him and protect him from predators (some of which are his own age!)? No. That's the simple answer. No. Although it is going to drastically challenge our family financially (going from two incomes to one), there isn't a sacrifice that my husband and I are not willing to make if it is going to help our son grow, learn, and become a phenomenal human being. The public education system is broken, and more and more children are losing their innocence too quickly. Drugs, gangs, predators, and uncaring, unprepared teachers abound in schools today. Some may say that we cannot protect our son forever. And they're right. But we can protect him from a fault-filled education, from a system that doesn't have his best interests in mind and from those who would try to steal his innocence too soon. 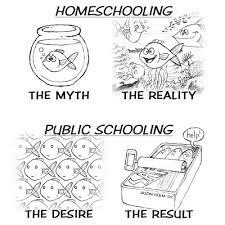 That is why we choose to homeschool.